An exciting new type of running challenge eventRunners will take part in four to five events, usually all on one day, and they are awarded points based on their finishing position; 1 point for first, 10 points for tenth etc. The overall standings are based on cumulative points, with the lowest score finishing first overall. All events are given equal weight, so a consistent and measured performance across the events is key. 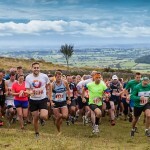 These events will be offered as part of the Top of the Gorge festival so not only will you have a fantastic running experience in a spectacular setting, you will also be able to enjoy all the festival activities too! Music, food, plenty of other sports, expert led talks and camping!